When I visited Mexico this past December, I bought a gorgeous copper pot from a young lovely woman in the city of Celaya. Although the most famous place in Mexico to buy copper pots is the town of Santa Clara del Cobre in the state of Michoacán, I visited Celaya to learn how to make Cajeta the traditional way. 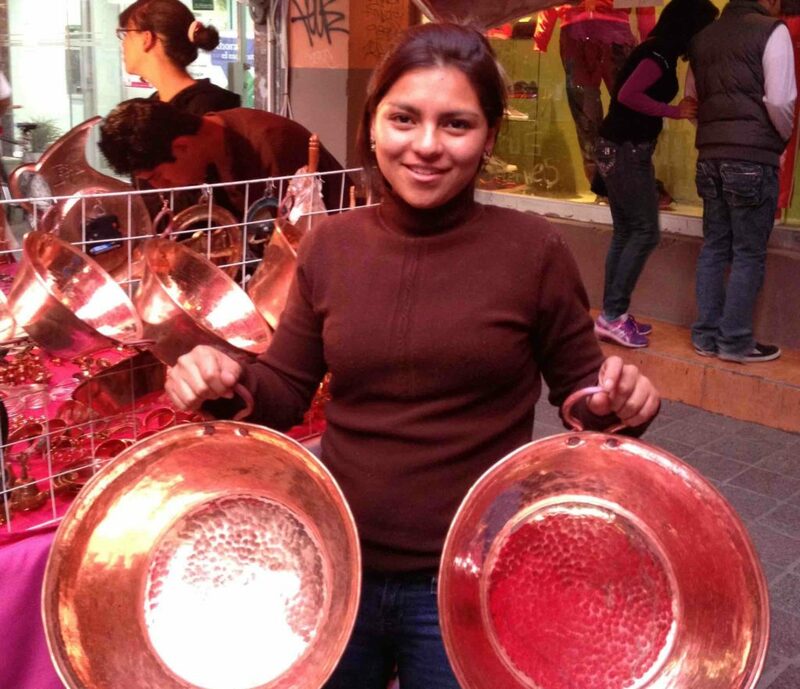 Traditional Cajeta makers consider copper pots a required tool for this craft, so Celaya has managed to make their own. And boy, are they pretty. Called cazo or olla de cobre in Spanish, Mexican cooks swear by these hand-hammered copper pots to make special things, such as carnitas for savory food, but mostly for all sorts of sweets. According to food science expert Harold McGee in his book On Food and Cooking, copper has a “high affinity for oxygen and sulfur, and forms a greenish coating when exposed to air.” To ensure that your copper pot is as clean as can be, that doesn’t corrode, and it maintains its pretty luster, you need to give it a good maintenance and cleaning regimen. As much as it sounds serious, it is quite easy! The woman who sold it to me taught me her method. Before and after using it, each time, clean it with a sponge and lightly soapy water, rinse it. 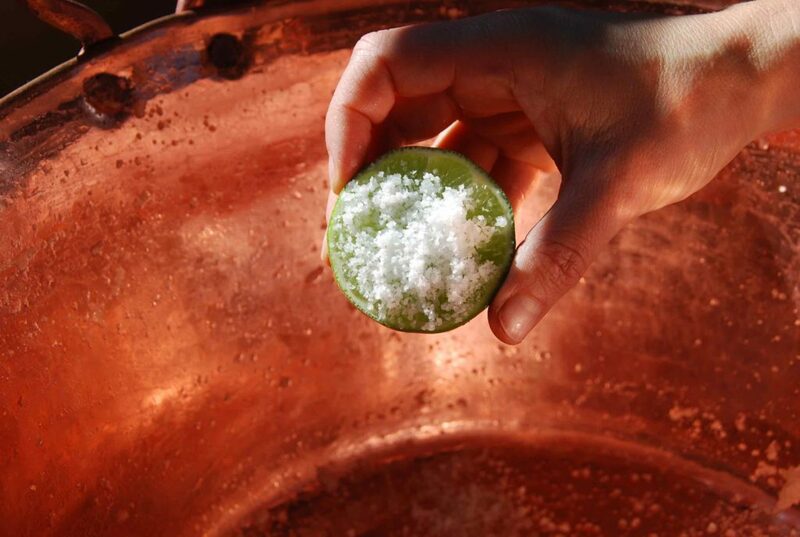 Then cut a lime in half and sprinkle a generous amount of grainy salt on it, kosher or sea salt will do. Use the salted lime to polish the pot, squeezing the lime to release the juice as you scrub along. Then just rinse and dry. 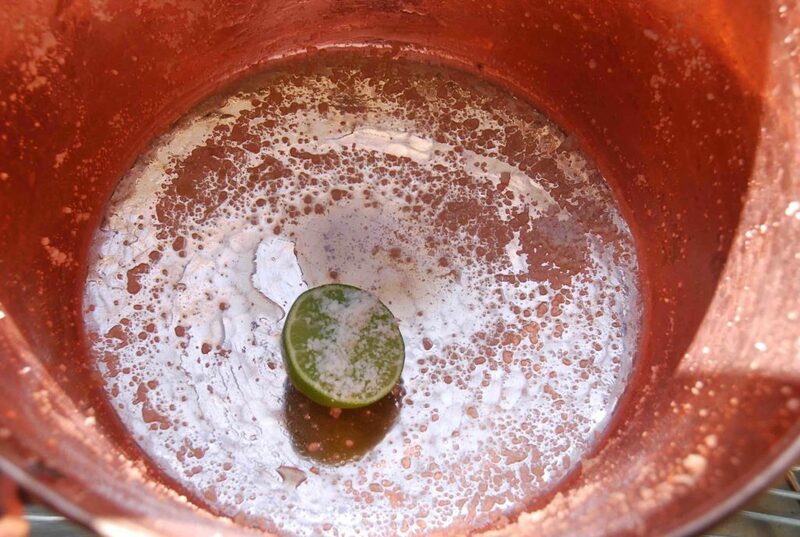 Other methods used to maintain and clean copper pots use another acid instead of lime, such as vinegar. The Culinary Institute of America’s book The Professional Chef suggests adding flour to the acid and salt mix to make a copper cleaning paste. The flour is just added for a more helpful texture of what’s used to clean the pot. Any method will work as long as you have an acid and a salt. The acid causes a reaction with the copper that erases the stains or discoloration and cleans it and the salt gives you the grittiness to scrub. I like to clean mine with warm soapy water, and then use half a lime covered in tons of grainy salt to scrub it. Some people like to use acid like vinegar, and if you do, try adding flour to the vinegar and salt to create a paste. Me fascina tu show y cada vez que veo tu programa me trae lindos recuerdos de mis vacaciones en Morelia y mi familia de allá. Mi pregunta es que clase de ollas/sartenes/cazuelas usas en tu programa para cocinar? Ya que tienen mucho que ver con los sabores de la comida. También tengo muchas ganas de una olla de barro. ¿Como se curan y que recomiendas antes de comprar? ​Muchas gracias por tu mensaje Hilda! ​Nos vemos pronto en Los Angeles! Hola! I bought mine in the town of Celaya in the state of Guanajuato and lugged it back to the States… but you can find great options here through Amazon! I ordered a copper cazo from Peggy at Mexico by hand. It is a functional piece of art. I am a micro goat dairy in Maine, making cajeta. The cazo is key for an authentic goat milk caramel. . Excellent customer service from Peggy at Mexico by hand. Beautiful addition to my kitchen. Thanks for the quick reply, Pati. Love your show! What about all your beautiful clay pots…where can I find those? Yours are so decorative — great shapes and colors. I’ll be in Mexico City next month, and hoping to bring (or as you say, lug) at least one home with me. Many are finds throughout the markets in Mexico, the brown ones are from Tlaquepaque! Too bad you don’t let us know where we can buy them! I live Texas or online site where we can purchase the cooper pots! Please love your show. All your recipes are great! Hi! I bought mine in the town of Celaya in the state of Guanajuato… Lugged it all the way to DC! While you can find opper cazos in other parts of Mexico, they are made in Santa Clara del Cobre, in Michoacán. We buy cazos, pottery, and other handmade crafts directly from artisans in Michoacan and sell them (wholesale and retail) in the U.S. I currently have cazos that are 14 in. in diameter, but can get other sizes. Does anyone have a good recipe for carnitas using the cazo? I am SO glad I found this! About 6 years ago inherited a pot exactly like the one in the picture from my husbands Grandmother after she passed away. It’s in pretty bad shape color wise though and I had no idea how to clean it. I’m trying this cleaning method this weekend! Thank you so much!! I think we all need a trip back to Celaya or San Miguel de Allende to buy these beautiful pots/bowls. I just bought one exactly like the ones in the photo of the young Mexican woman holding one on each hand. Same approximate size. I got it at “La Colmena” supermarket in Detroit , MI for $120 plus 6% tax.It is expensive but I think that even if I bought it for $50 in Mexico (and I do not know how much it would really cost) I would find it very difficult to bring back to the US, it is somewhat heavy and definitely voluminous. In Mexico, my Mom and her friends use these type of copper pot to cook “nopales” mainly. They say that using the copper pot, nopales keep a darker green color instead of turning pale green when cooked. Not sure if that is true or if I am ever going to cook anything in it, I just love the way it looks in my kitchen. They do look beautiful in the kitchen!! Thank you for sharing, Keiko. Great information! 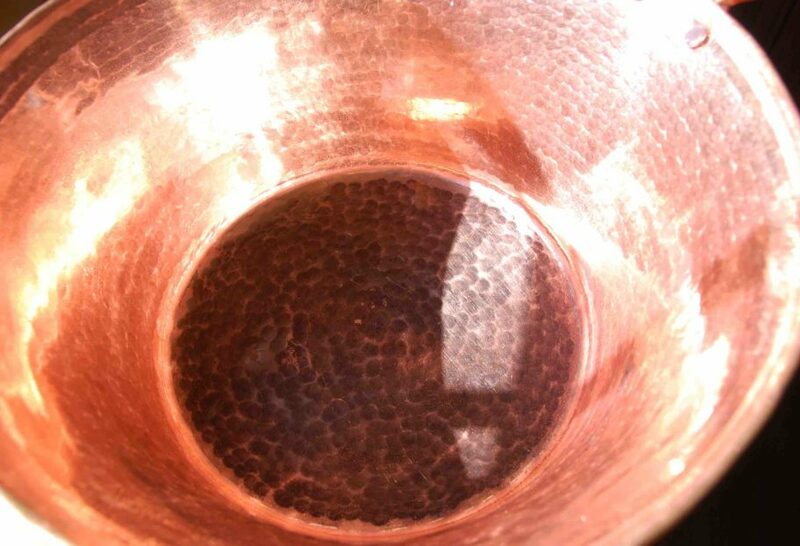 Where can you find a copper pot here in the U. S. A. in the state of Texas? Are you still interested in a copper cazo? Yes, would like to know where in Texas i might find one. Also the price of a copper pot. Jen asked the question, could she cook the chocoflan in a bundt pan. You told her yes, but my question is do you put the bundt pan in a pan of hot water and cover only it or the water and bundt pan also. Terry S.
You cover it all!! Place bundt pan with chocoflan inside in the baking dish and pour hot water to come up to about half its height (of the bundt pan) and then cover the whole thing with a long piece of aluminum foil. Cobre is also excellent to use when whipping egg whites! Yes, it is!! Thank you, Gerald! You said you bought a copper pot. Does this lady have some way that we can buy her copper pots from the states and how can I get information. Or does she have a website.